Location: Downpatrick, County Down, Northern Ireland. 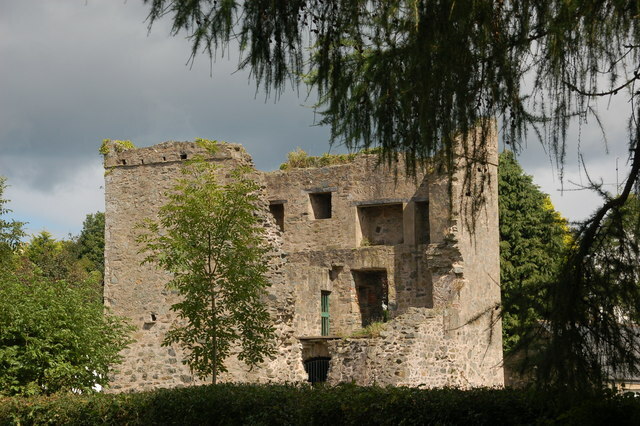 Notes: Quoile Castle is a castle situated 1.5 miles (2.4km) from Downpatrick, County Down, Northern Ireland, just off the main road from Downpatrick to Strangford, on the east bank of the River Quoile. It is a 16th-century tower house, which was inhabited into the 18th century. Quoile Castle tower house is a State Care Historic Monument in the townland of Quoile, in Down District Council area, at grid ref: J4963 4701. The south corner of the building has fallen down and shows a cross-section of the castle. In the north east wall the doorway has been rebuilt and gives access to a straight mural stairway. This is protected by murder-holes at the bottom and at the top. The inner doorway at the ground floor opens into a chamber with a stone vault and many small gun-loops. Beyond this is a second similar chamber. The first floor has two rooms and one of them has a fireplace. The second floor is reached by another straight stairway within the north west wall. There is another fireplace at this level.The south corner of the building has fallen down and shows a cross-section of the castle. In the north east wall the doorway has been rebuilt and gives access to a straight mural stairway. This is protected by murder-holes at the bottom and at the top. The inner doorway at the ground floor opens into a chamber with a stone vault and many small gun-loops. Beyond this is a second similar chamber. The first floor has two rooms and one of them has a fireplace. The second floor is reached by another straight stairway within the north west wall. There is another fireplace at this level.In 1986, seven silver sixpence pieces dating from the time of Elizabeth I were found at the castle.